GULFPORT, MS (WLOX) - Robert Lubin received a warm Mississippi welcome from Gulfport Mayor Billy Hewes, during a late Tuesday evening press conference, where big plans were announced to grow the city's tourism market. "We're just glad to be at the point where we can say with affirmation, that we have a new partner and we look forward to a long standing relationship. So Rob, thank you and welcome," said Hewes. Virginia based attorney Robert Lubin works with Mississippi Coast Entertainment, LP. 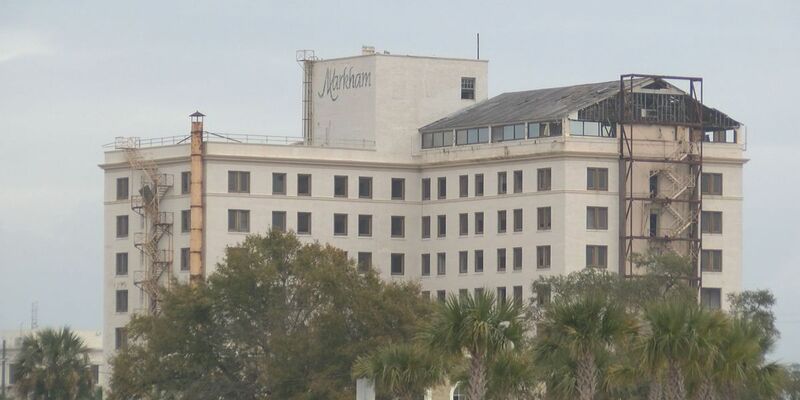 He announced his plans to develop the historic Markham Hotel and build a casino near the Gulfport Harbor. "What's interesting is the Markham project came first. I work with a group of fellows who found the Markham project, and we decided to go forward with it. We looked at the viability of it and decided to go forward with apartment living and office building kind of project over there," said Lubin. The announcement to develop the hotel came as a bit of a surprise, just hours after announcing the waterfront casino project, which is to be built on the same 10 acres of land where Rotate Black once looked to develop a casino. But Mayor Hewes said this announcement is much more promising than the ones before. "This represents not only an economic development impact, but with the amenities they're proposing to bring, we're going to have more opportunities for families. It's just going to be one more point resort destination we've been moving towards. So this is a great day for Gulfport and the coast," said Hewes. Mayor Hewes said they still have a couple more months to iron out the casino details, and it will probably be two years before it's a reality. Lubin added that they have been discussing the old VA property off Highway 90, as well.